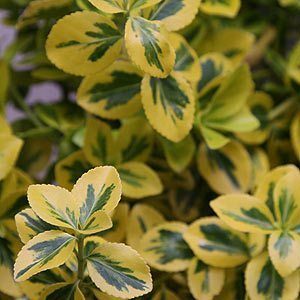 Widely as hedges and species such as Euonymus japonicus microphylla and its variegated versions are popular with landscapers. In fact the popularity of the variegated varieties is perhaps one of the biggest problems. They were widely used in commercial landscaping for many years, and in fact we would say overused. They are tough, cope well with dry summers and are easy care, therefor popular, however just don’t overdo it with Euonymus japonicus. The low growing Euonymus microphylla ‘Tom Thumb’ is a slow growing variety, green foliage and very useful as a low hedge in full sun to part shade. Try spacing these at around 25 – 30cm for a good dense informal hedge. One other issue with the variegated forms is a tendency to revert to the true color, a dull green. Simply prune these bits away as they appear. E. fortunei ‘Pierrolino’ is a variegated cultivar of Euonymus species which are a group of evergreen or deciduous small to medium shrubs. E. europaeus or Red Cascade Spindle Tree. E. alatus or Winged Euonymus or Burning Bush are all popular. E. japonicus ‘Green Rocket’ has new lime green foliage turning a deeper green with age. Another good low hedging plant, also used for topiary. E. ‘Emerald Gaiety’ has pale yellow to cream leaf margins. E. ‘Emerald Gold’ has golden yellow leaf margins. E. ‘Tom Thumb’ – An excellent low growing variety that reaches around 50cm in height. A good choice for underplanting taller evergreen border plants. Euonymus are reasonably drought tolerant once established, in terms of foliage color they perform best in full sun but will also cope with part shade.